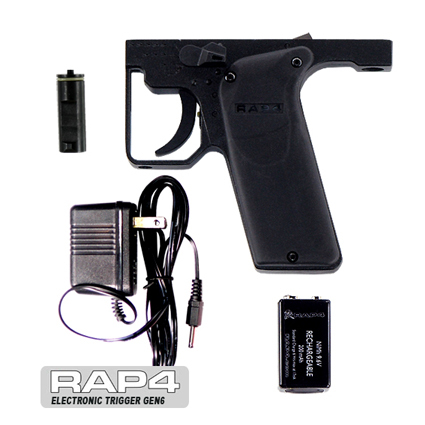 This etrigger works with T68 Gen4, Gen6, Gen7 and Splitfire Marker. - Has 3 selectable firing mode: Semi, 3 Rounds Burst and Full Auto. - Note: This etrigger works best with 9.6V battery. - Note: Marker will not exceed 300 fps with etrigger. into 3 rounds burst and full auto mode. During the lockout mode, the trigger will only shoot semi auto. Kit includes: E-Trigger, 9.6v Battery, 110V Charger, #42E E-trigger Hammer #41E Hammer Dampener, #40 Velocity Spring and Frame Attachment screw set.